professional PCB design tool like Easy-PC - cost effective and scalable. be highly responsive at every stage of your design process. dedicated manned support - have you, the customer, in mind. Use global technology files to ensure conformity to your company/manufacturing design requirements. Technology files contain predefined design information, styles and rules such as Pad/Text/Track Styles, Layers, Spacing rules and colours to be used within the design. Edit and manage your library items; Schematic Symbols, PCB Footprints, Components and 3D packages in one single management tool. All stages of the process are easy to do and result in correct first time libraries. Manage a new version of your complete Project without the need to manually include and remember files within it. All files can be saved using new names and/or with numbers to denote new versions. Easily create two or more variations of your design without having to create separate design files or have to resort to complicated schemes to create your Bill of Materials (BOM). 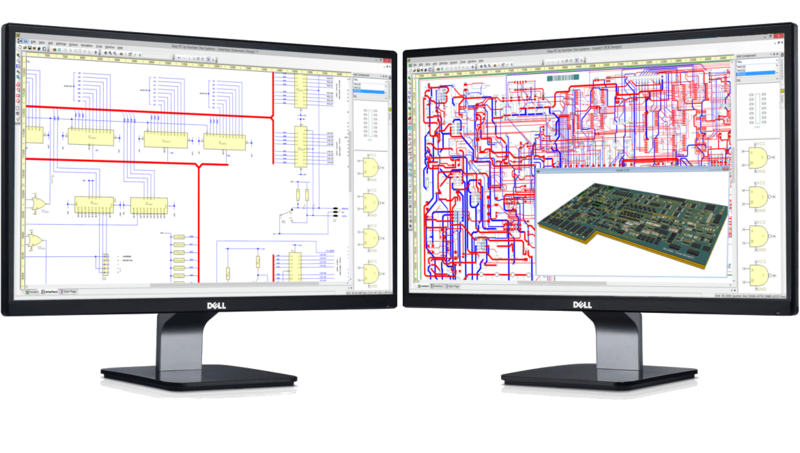 Preview your PCB Design in the 3D Viewer enabling you to visualise the design. You can also print the 3D view to an image for use in documentation. Instant bi-drectional cross probing is available between the Schematic and PCB layout designs. All aspects of the design can be probed and highlighted, such as pads, terminals, nets and Components. Easy-PC has all the standard manufacturing outputs you would expect from a professional product. Outputs are available for Gerber, Excellon, IDF/DXF, Windows, ODB++, GenCAD, Bill of materials (BOMs), Pick & place reports, Assembly drawings, Bitmaps and WMF, and many more. 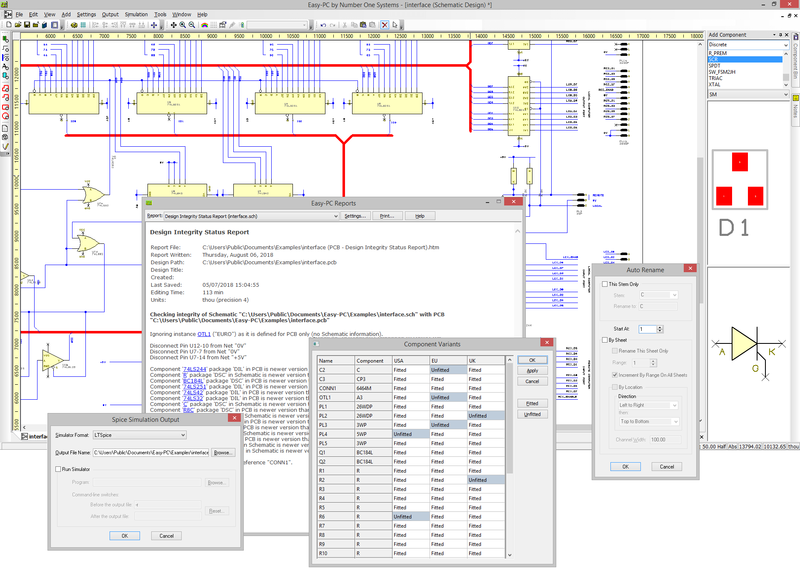 The Easy-PC Schematic editor allows you to create clear and concise schematic drawings. Multi-sheet drawings can be easily combined within a project file, allowing all net and component names to be managed and synchronised. The Design Rule Check examines your Schematic designs, check for a number of possible errors to help you avoid downstream problems in generating the layout or more often in using the Schematic as documentation for engineers to troubleshoot the finished boards. Intelligent bus items can be drawn in the design with ease. These busses can be 'closed' containing specific net names, or they can be left 'open' to give you flexibility. Bus nets can be drawn with connective nets or left for full implied (invisible) connectivity. Schematic design sheets in a project can have a hierarchical structure. These can be a combination of both 'Top Down' and 'Bottom Up'. Updates and modification to Schematics can be passed forward to PCB with name changes in the PCB being back annotated to Schematic design. 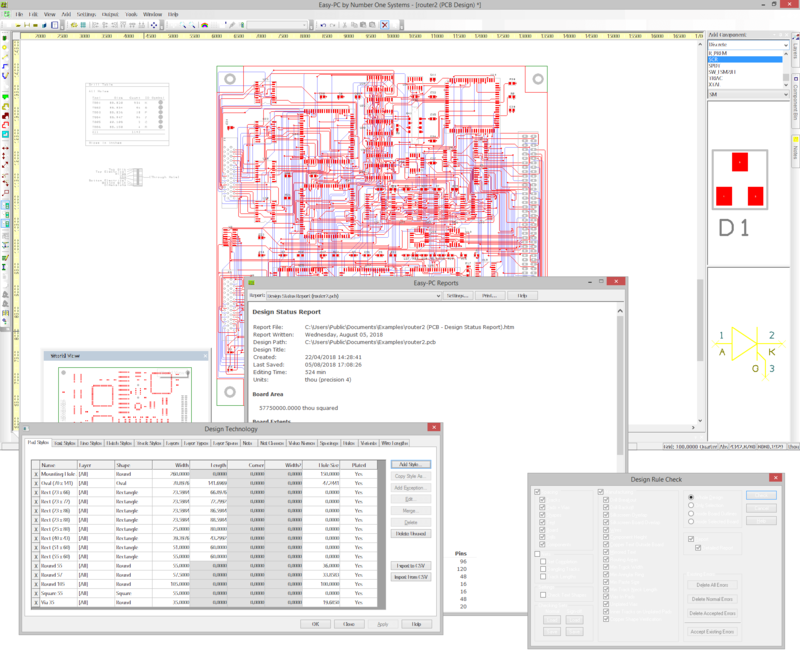 If you do not wish to create a Schematic, simply start creating your PCB straight into the PCB design editor. You can also import Gerber files to intelligently rebuild the PCB design. Using the intelligent Apply Layout Pattern feature within Easy-PC, you can define a piece of circuitry or 'Golden Circuit', and apply the layout positions and routing of that defined circuit to a series of grouped parts within the design. This dramatically reduces design time and ensures accuracy of trace lengths. With online DRC (Design Rule Check) switched on, error markers instantly indicate design rule spacing errors and the error location during the design layout process. A detailed report comparing the Schematic and PCB designs can be produced; this maintains full design integrity at all times of the process. Easy-PC provides fast copper pouring with control on thermal relief, isolation gaps, and the number of spokes, plus removal of unwanted copper 'islands'. Flexible, powerful and easy-to-use, add copper of any shape to the design. Easy-PC offers full support for split and partial powerplanes. The view powerplane facility enables you to view the powerplane using the same mechanism as used for generating it at the plotting stage, this ensures accuracy rather than simply looking at a "bitmap" image. Easy-PC has two highly efficient and comprehensive autorouters which are fully integrated into the program. The Tracerouter comes as standard with the purchase of an Easy-PC license, whilst the Pro-Router can be purchased additionally if your designs require its powerful capability. Create your own Bill of Materials (BOMS), Parts lists and Net lists using the powerful report writing feature within Easy-PC. Prices are available in: £ Sterling, US $ and € Euros. Please note that when ordering, the currency used will be the one that is appropriate for your distribution outlet.